Deciding on to buy a product, service which has no reviews so far anywhere is very frustrating. The decisions will be made by the visitor depending on some important factors which he desires to be present in the product which is being bought. As you may have noticed on many websites all products with great reviews gets new visitor leads pretty easily. The importance of a review system for your product on multiple websites or on the website you are deciding to sell it is essential. WordPress users get amazing plugins for everything and review plugins are available for WordPress with great features. Some plugins are premium with extreme set of features which free plugins cannot afford to add. Many blogs make affiliate earnings by reviewing products for which they have registered as a partner. A interesting review system is like a short summary of long article review made on the product in graphical view. So it will be essential for reviewers to have a plugin which let them add custom criteria of items, a good title for the review box, choice of colors to match their own website etc. Rating the review system is possible with these plugins which allows user or guest votes to be added on review system itself. This can be very important as user votes is a indicator where viewers agree with the review and a system to distinguish fake reviews. Find free, premium, responsive plugin review here with future updates. All plugins i have reviewed today has proper microdata as recommended by the schema.org website. The Google rich snippets takes this proper microdata integration on your website post, page to display them nicely on the Google search results. From a SEO perspective it is a high ranking factor and also a traffic factor to get high CTR to your website from others which have none, even if your website isn’t in first result. Make the search engine results visually appealing to get great amount of traffic flowing. Enough said take a look at below WordPress plugins for review system. Let your customer leave worthy review of your article and you can give the option to do so with this free WordPress review plugin we have introduced today. These customer testimonials are well markup with schema so that they appear in search results as well. A similar plugin as mentioned above this plugin let your customer do the review after a email confirmation at their end. You still have full control over the customer reviews submitted on your website as you can choose to accept or decline them as required. A book website review plugin made especially for increasing traffic with rich snippet data which is approved by Google search engine results. A plugin has been introduced by themeshop which looks great and the best of all its still free. You can also choose from three different rating points with percentage values, star rating and bar values. Adding criteria, review title and summary description is easily possibe with this free plugin and the options for guest users to rate the review is also available as we see it in all standard best WordPress review plugins these days. The responsive design goes well with any theme as we can see the values are properly adjusted for mobile, tablet devices. The widget support is important and themeshop understands this so they have integrated widget support to showcase your popular reviewed products. With infinite color variations and flat design this is suitable for any modern WordPress theme which requires a review system. The support for Google rich snippets is also provided with criteria items properly assigned with microdata elements. The shortcode can let you add the review to any part of the post, page you like and this plugin is already compatible on wordpress v 3.9 . Compare and review any related articles/products you have added with this review plugin for WordPress. This is a premium plugin and has a powerful set of features with beautiful display of reviews. This is a responsive review and comparison plugin for rating, reviewing, comparing your products with other similar products. The plugin comes with 8 custom themes which can be further customized to match your personal interests. 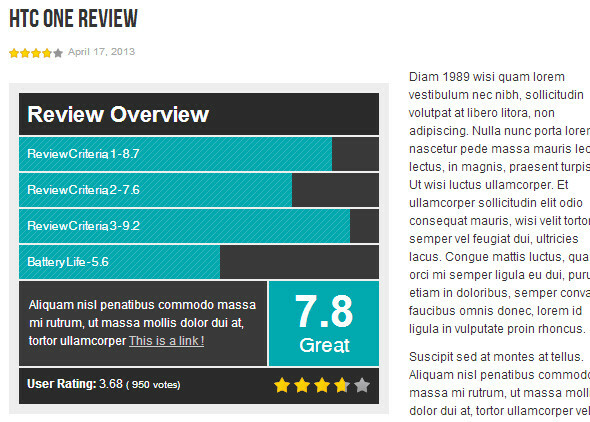 Ratings can be displayed in many formats like single color bar, stars, circle progress bar like style etc. Adding custom criteria for the review is easily possible which also have a option to display pros, cons in a unique style. Users can rate the review if they find it useful and i think this is a useful function. It will take some time to get used to but overall a solid review and rating plugin for WordPress with every feature you wish you need. Add review which are top, best or anything you choose in sidebar for user attraction. Shortcodes are supported for custom integration anywhere in posts, pages along with rich snippet support. The retina ready support will make your reviews look great on big displays as well. 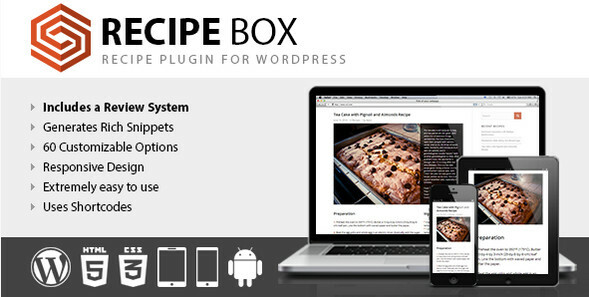 This is a perfect plugin for creating high quality food recipe blogs which is powerful in review options and shows up in google serps. This premium WordPress review plugin will let the author review a product and add their favorite criteria items by providing honest review of the product. Well integrated with WordPress this plugin has many features like shortcodes, widget integration which can improve the interactivity and thus making the rating system much more appealing at the user end. You can add unlimited criteria items to the review table and change the position of each criteria as you wish anytime by editing the post options for Taqyeem in edit post. Changing colors of the criteria bars is also possible and the option for guest user to rate the reviews is just awesome. Taqyeem is an all in one plugin which is responsive, suitable to your gird layout system for posts with 1/3rd or 1/2nd options. It has shortcodes and great SEO support for rich snippets with proper schema and microdata. Stay tuned for more updates in the future as we find new plugins either free or premium worth of mention. Let us know if you have any review WordPress plugin to recommend for our visitors. Lots of good information here, but none of these quite fills my needs. I am looking for a plugin that will aggregate reviews from the major review sites such as Google, Facebook, Yelp, Trip Advisor, etc and allow me to display the best of these reviews on the website. It should display with a link to the original review site so that people can verify that the review is legitimate. Any ideas on where I could find such a plugin?